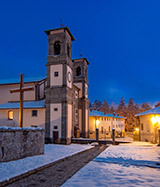 The Castle of Poppi is not only considered the symbol of this town, but also of the entire vally of Casentino. It often looks different, depending on the time, the environmental conditions and the seasons, but always suggestive and fascinating. 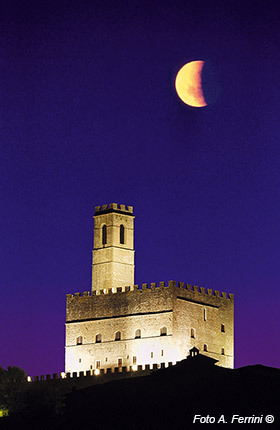 It was built between the end of the 12th century and the beginning of the 14th by the Guidi noble family and it is the "youngest" castle among all those ones built by this powerful lineage in Casentino (a Tuscan land which is renowned for its castles indeed). At the end of the 19th century, its tower was reduced by about ten meters because of damages caused by a lightning bolt. With the exception of the tower, the "relative youth", care and solidity with which the Castle of Poppi was built certainly are the main reasons why nowadays it shows a look very close to the one that it could have during the Medieval period. 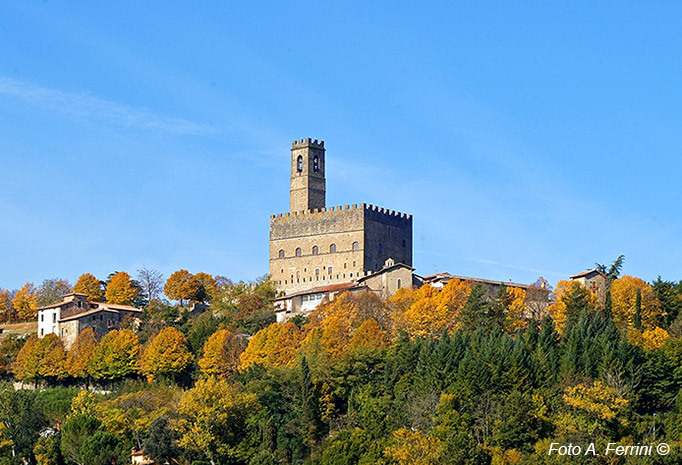 From panoramic views of the town the Castle of Poppi already shows its majesty, which becomes greater and greater as we get closer. A bust of Dante Alighieri, located in the adjacent square, reminds us of the bond between the supreme poet and this historic building: in fact, during his exile from Florence he was hosted in the castle for one year by Counts Guidi. It seems that Dante composed his 33rd canto of the Inferno during this period. To access the Castle of Counts Guidi of Poppi, we cross a small bridge over a dry moat that brings us to the "munizione", a building designated as armed watch of the castle. Through this small building we get to the outer courtyard that goes around the palace of the Guidi; in this space is an elegant well. As soon as we enter the castle we find ourselves in the inner courtyard. 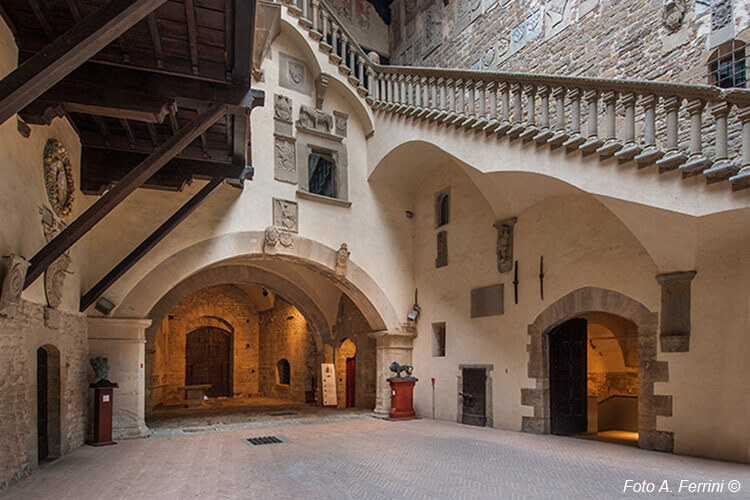 Our eyes will turn instinctively upwards attracted by the vertical development of the building, the wooden walkways and the harmonious staircase made at the end of the 15th century by the architect Turriani. Starting the visit of the castle from the ground floor, a small door (on the right, as we enter) leads us into a tight and narrow prison. Continuing around the courtyard, we find the Stables of the Guidi, a large room with a characteristic Medieval architecture, nowadays used for exhibitions. 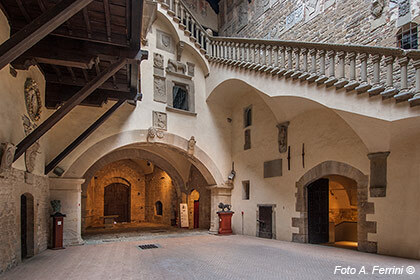 At the bottom of the courtyard, there is a stone table called "justice table" because from half of the 15th century, the period in which the courthouse was established in Poppi, justice was administered and sentences were issued on the table. A few meters away from it, a door lets us descend into a room situated underneath the court that was dedicated to Tommaso Crudeli, a poet from Poppi of the first half of the 18th century. The internal walls of the entire Castle of Poppi are decorated with numerous coats of arms; on the ground floor we find the most refined as they were made with glazed terracotta by the Della Robbia, the famous family of Florentine potters. Climbing to the first floor, we can visit the ballroom. Here, the Counts Guidi used to hold banquets, parties and shows. The room is richly decorated and there is a preserved terracotta by Benedetto Buglioni depicting the Madonna of the Girdle and Saints. 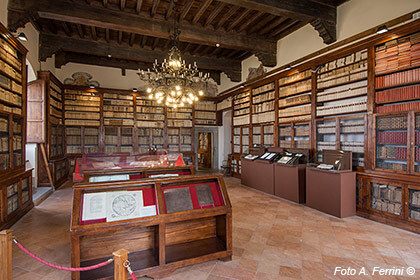 On this floor is the cultural jewel of not only the castle, but also all of Casentino: the Rilliana Library, a priceless collection of 25,000 ancient books. It was built after the death of Count Fabrizio Rilli-Orsini (1828), who donated his huge patrimony of books to the community of Poppi. We now go up to the top floor of the Castle of Poppi, also called the Noble Floor because there were the residential rooms of the Counts Guidi. These noble rooms are all covered with frescoes. The interesting model of the Battle of Campaldino is displayed in the largest room. It shows the deployment arrangements of the Guelph and Ghibelline troops before facing this bloody conflict, which took place on June 11, 1289 in the plains of Campaldino, within easy reach and view from the castle. 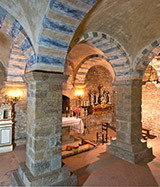 The Chapel of the Guidi, located on this floor, is of great interest: it is a real jewel of art. 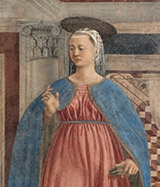 The frescoes at the top of its walls were executed by Taddeo Gaddi, a disciple of Giotto, during the first half of the 14th century and depict six sacred scenes: two dedicated to John the Evangelist, two to the Virgin, two to John the Baptist. From the walkway of the Noble Floor, a steep wooden staircase lets us reach the bell-chamber on top of the tower. We will have to face 104 steps. Along the way, also to take a breath, we recommend stopping to observe the ancient clock mechanism. Once at the top of the tower, our effort will be well rewarded by the broad views of the Casentino which can be enjoyed from up there.